Editing between shots in VR is challenging. Mostly this is because you can’t be sure where the viewer will be facing when it’s time to cut. It’s dangerous to put important events at the beginning of a shot because a viewer might miss them before she has time to decide where to look. We’re viewing things top down. Each ring moving out from the center is a new shot. Since we’re addressing 4D problem in 2D, we’re simplifying things quite a bit. We’re only caring about one of the three degrees of rotational freedom: arguably the most critical one, pan. Neither tilt nor Dutch tilt are in play. The black dot is the direction you’re meant to face at the start of a shot. The white dot is the direction you’re expected to be facing by the end of a shot. So when editing, you just rotate the rings to line up the dots. You have to create shots that can have dots that line up. And before you can do that you first have to figure out how to create shots with dots at all (places where the viewer’s attention lands reliably). And unless you live in a world where no HMDs have cords or all your viewers have swivel chairs, you have to worry about not going in circles all in one direction or the other. 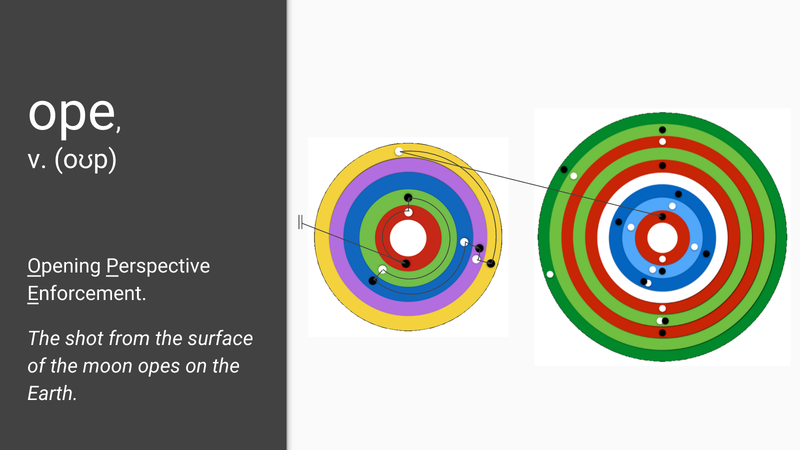 In terms of Jessica’s diagrams, you’d end your current circle, jumping off its final outermost ring, and move over to start growing a new circle of rings. I’d call a move like this an “ope”, standing for Opening Perspective Enforcement. As a verb, too, one could say, “The shot from the surface of the moon opes on the Earth.” It sounds a big like “the shot opens on,” which I consider a feature of the word, and I was pleasantly surprised to discover that “to ope” is in fact an archaic form of the verb “to open”. You can force any combination of the three degrees of rotation, and preserving what the viewer is doing is in any of the others. For example, you could “ope the tilt” onto a plane in the sky (as long as you oped the tilt back to normal for the rest of the sequence, most likely). Another subtlety: if it is the case that humans keep track of their real world orientation, you would be accepting by oping that viewers would experience different differentials between that and their orientation in your VR experience. You are currently reading ope at cmloegcmluin.